At the beginning of this week as part of my Fitness Challenge, I committed to waking up in time to exercise. What this also included was getting up early enough to spend quiet time with God. See, what happens is I hit snooze too many times, my kids wake up, the day starts, and I miss my prime time, which includes reading my Bible, praying, and getting in a little exercise. So, I decided I was not going to hit snooze this week. I was taking the option away. The same day that I decided to do this I walked into my bedroom after my daughters had been playing and found a study guide that was from my youth pastor laying on the carpet. Keep in mind I have been out of school for 13 years! The guide was not filled out, but it’s a 30-day guide to help you start building the routine of a “quiet time”. So, I jumped right in. Jesus didn’t wait to squeeze his time praying in as he fell into bed at night. He made a point to get up “very early… while it was still dark”. When I push off my time to read the Bible and pray, a lot of days, I don’t end up getting around to it. I like to use the excuse that “I’m too tired” so I can hit the snooze button. There are a million reasons for this: I stayed up too late, the kids woke up a hundred times during the night, it’s too cold, the blankets are “just right”… If you read the verses before Mark 1:35 you find that Jesus had a busy day the day before. He ended his day by having lots of people come to him after the sun had already set, and he healed them. I would think this might make Jesus tired. BUT, he got up “very early” the next morning anyway. How early did he get up? We don’t really know, but we do know that it “was still dark” outside. I think that Jesus did this because he knew he needed that time to pray. It was a priority to him, so he made sure it happened. He got up while others were still sleeping and before the demands of the new day pulled him away. Jesus didn’t start praying while he was still laying in bed. Why? I’m guessing because when I try to pull this shortcut off, I almost always end up falling back asleep. Jesus actually got up, out of bed, and left the house. This can be a tricky one, especially for mothers. My children start waking up at almost the crack of dawn. I was the same way as a child, so I know it’s most likely not going to change. We don’t live in a huge house and sometimes it’s hard to find a solitary place. I have found that one of my best places is to stay right in bed. Wait, didn’t I just say to get up out of bed? That’s right, but I think you can do both. I wake up, move around a little, turn on my lamp and sit back in bed (not lay down), and begin my time with God. This way if my children are awake they can be in the living room or kitchen and I can still have a quiet time. My husband is sleeping and not a distraction. This one was harder for me to do. I don’t have a hard time remembering to read my Bible, but to sit and prayer tends to be more of a challenge. This study guide leads in some areas to pray on and I have actually found by starting my day in prayer I am much more likely to pray throughout the day. The guide also has me record each day a few areas that I saw God answer prayers in the day before. This was a little bit of a struggle the first day and that made me realize that I am not being as thankful as I should be. Even when life is rough, God is faithful and anyone can find something to be thankful for each day because God is always moving. We just need to take notice. What am I even supposed to do when I have a ‘quiet time’? That’s a great question! A “quiet time” or “devotion time” is just simply a time to find a quiet place and study the Bible and pray. The Bible was written so many years ago but is still so relevant to life today. I have experienced countless times where God “speaks to me” through the Bible. This isn’t me hearing his voice, it’s as simple as a verse or two really jumping out with meaning to a situation in life when I have read the same verse many times before and noticed nothing. Praying includes everything from saying what you are thankful for (food, health, shelter, forgiveness, loved ones, a new job, anything at all), asking for guidance and help, acknowledging the things you have done wrong, and saying what you love or appreciate about God. Sometimes, when I don’t know what to say, I just sit quietly for a while. 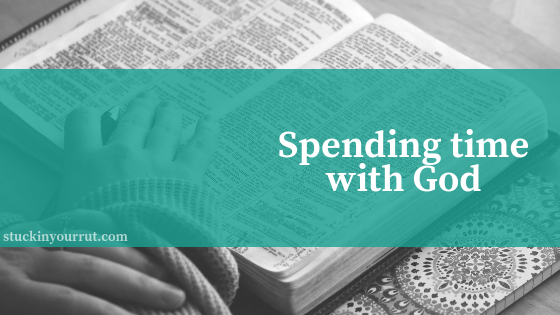 Interested in more resources on having a quiet time with God? Let me know, leave a message or contact me. I would be happy to help or to point you to someone who can. Do you have some great tips for how to get a quiet time in each day? Or a favorite devotion book that you have used? Share in the comments.